Were you harassed at work because of where you are from, what you wear, or how you speak? Did an employer refuse to hire you because of your race, religion, or ethnicity? National origin discrimination encompasses a wide array of discriminatory practices in New York City workplaces. If a company, boss, or co-worker has treated you poorly, and you believe the misconduct is related to your national origin, you may be entitled to compensation. Title VII of the Civil Rights Act of 1964 protects individuals from discrimination based on their national origin. National origin discrimination in employment involves treating individuals, employees and applicants, unfavorably based on their national origin, including individuals being from a particular country or region. This type of discrimination can include discriminating against individuals based on their ethnicity, accent or their perceived ethnic background, regardless of whether they are actually from that particular ethnic background. Further, the law protects individuals regardless of whether the victim and harasser are of the same national origin. The law forbids national origin discrimination in any form of employment, including the hiring, firing, amount of compensation, job assignments, promotion, training, fringe benefits or any other term, condition or privilege of employment. Under federal law, harassing an individual based on their national origin amounts to discrimination. This type of harassment includes offensive or derogatory remarks about a person’s national origin. The law does not protect simple teasing or isolated offhand comments. The law is targeted at harassment that is so frequent and severe such that it creates a hostile or offensive work environment or results in an adverse employment decision, such as being fired or demoted. While lawful on their face, clever employers often construct policies that apply to everyone, no matter their national origin. These policies often have the effect of discriminating against certain individuals based on their national origin, and are often not related to the job or the necessary operation of the business. For example, many employers enact “english-only” rules to weed out immigrants. While generally unlawful, these type of policies are allowed if they are needed to ensure safe, efficient operation of the business and are not put in place for the implicit purpose of discriminating against individuals from certain nations or regions of the world. An employer may not base an employment decision on a employees accent unless it seriously interferes with that individuals ability to perform their job. In 1986, Congress enacted the Immigration Reform and Control Act (IRCA), making it illegal for an employer to discriminate with respect to the hiring, firing or recruitment or referral for a fee, based upon a person’s citizenship or immigration status. The IRCA was designed to prohibit employers from exclusively hiring US citizens, or lawful permanent resident, unless required to do so by law or government contract. The IRCA forbids employers from refusing to accept lawful documentation which establishes employment eligibility, or demand additional documentation beyond what is legally required by the Department of Homeland Security, leaving the choice in the hands of the employee to determine which Form 1-9 documents to show to verify employment eligibility. The IRCA also prevents employers from retaliating against individuals for asserting their rights under the Act, to include filing charges or assisting an investigation proceeding under the IRCA. The IRCA claims are enforced by the Department of Justice’s Office of Special Counsel For Immigration-Related Unfair Employment Practices. Employment discrimination based on your place of origin. Employers are prohibited from discriminating against an individual based on where you are from or the country/location your ancestors originated from. These protections are extended to areas who are not recognized as a nation, for instance, refugees from a defunct government are covered by this act. Employment discrimination against a national origin group. Ethnicity – Membership of an ethnic group is often defined as shared cultural heritage, ancestry, origin myth, history, homeland, language and/or dialect and sometimes ideology, manifests itself through symbolic systems such as religion, mythology and ritual, cuisine, dressing style, physical appearance, and more. Employment discrimination based on perception. An employer is prohibited from discriminating against an individual for being a part of a particular ethnic group, even if the individual does not identify with that culture. This could include harassing you because an employer or co-worker thinks you are a member of a particular racial, religious, or ethnic group whether or not that perception is correct. Employment discrimination based on affiliation or association. Your employer cannot harass or discriminate against you because you associate with a person of a particular national origin. Our skilled attorneys at the Derek Smith Law Group, Pllc have years of experience litigating claims based on national origin and are prepared to give you the representation you deserve. IS CITIZENSHIP A PROTECTED CLASS? Under the IRCA, citizenship is a protected class. Congress passed this Act because employers are often hesitant to hire individuals who look or sound foreign. Citizenship status is different from nation of origin, however, the IRCA protects both classes. WHAT IS NATION OF ORIGIN DISCRIMINATION IN NEW YORK? Under New York City Law, ethnic/national origin discrimination occurs where employers base employment decisions on an individual’s national origin, opposed to how well or how qualified and individual is for a particular job. These laws often mirror federal laws, with the notable exception of the state law only requiring an employer to have four (4) employees before a claim can be made, as opposed to the fifteen (15) employee requirement under federal law. These protections extend, not only to explicit policies, but polices which have the effect of discriminating against ethnic minorities, such us “English only” policies that have little to nothing to do with the actual performance of the job. According to the New York Commission on Human Rights, National origin not only includes an individual’s place of birth, but also that individuals ancestry. The NYHRL prevents employers from discriminating in the refusal to hire or employ, or bar or discharge from employment, or to discriminate against such persons in terms of their compensation, terms, conditions or other privileges of employment, based on an individual’s national origin, this includes a persons perceived national origin. An individual may file their claim in state or federal court, but not both. A recent case filed in NYC by the EEOC is that of Antonella’s Restaurant and Pizzeria. Here, Hispanic employees alleged they were subjected to a hostile work environment by the restaurant’s co-owner almost every day. This harassment included the co-owner calling employees severe and frequent racial slurs based on the employees country of national origin. The co-owner further required that individuals on speak on english in the workplace and these employees were given unfavorable treatment concerning their leave and sick days. The EEOC further alleged that these Hispanic employees suffered an adverse employment decision, being fired, as retaliation for complaining about their mistreatment. This type of discrimination is often brazen, for example, in Mitsuwa Corporation /d/b/a Mitsuwa Marketplace, the EEOC brought claims, alleging that Mitsuwa Hispanic employees were discriminated against based on their national origin. Mitsuwa routinely paid Hispanic employees less than other non-Hispanic counter parts who performed the same work. The Case was settled for $250,000 and injunctive relief. These type of claims often go unfiled because employees fear harsh retaliation for reporting unfair labor practices, specifically, deportation. 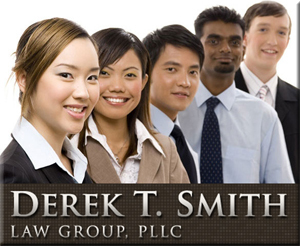 Our skilled nation of origin discrimination attorneys at the Derek Smith Law Group, PLLC, have years of experience working with individuals to ensure they are being treated fairly in the workplace. WHAT IS NATION OF ORIGIN DISCRIMINATION IN NEW JERSEY? New Jersey provides a robust anti-discrimination law. The New Jersey Law Against Discrimination (“LAD”) holds that an employer may not discriminate against an employee based on their national origin. It holds that individuals have the right to apply for, and be fairly considered for, any job, internship or traineeship, regardless of where an individual may come from. Employers are restricted from discriminating against employees when applying for a job, during the course of employment, or when an individual is terminated. This law is also applicable to labor unions and employment agencies. It further prohibits any of these groups from printing, publishing or causing to be printed or published, any advertisement which specifically bases employment opportunities, job openings, Union membership, apprenticeship programs or job training programs on an individual’s national origin. The New Jersey Division of Civil Rights brings claims on behalf of individuals. One such claim was that of Vlad Varga, who brought a claim against his former employer Diversified Automotive, Inc. Varga claimed that his employer discriminated against him on the basis of national origin. After his wife had given birth, Varga, a person from Romania, requested four weeks off to take his family to Romania for a baptism, with plenty of notice. His employer told him that if he were to take the vacation days, he would be terminated. Varga took the leave, and was subsequently terminated. Varga based his claim of national origin discrimination on the fact that a similarly situated employee was granted leave to go their home country of Guatemala for the same amount of time. The Director of the Division of Civil rights found probable cause to take this case to a trial for ultimate resolution of the case. Allowing one employee to take vacation to his home country, but not allowing another similarly situated employee to take vacation to his home country may rise to the level of national origin discrimination, creating a question which can only be determined by a jury often pushing employers to settle these claims. This law requires individuals who feel they have a claim based on national origin discrimination to file their claim within six (6) months of the act of discrimination at one of the Division of Civil Rights Regional Offices, either closest to where an individual lives or closest to where the act of discrimination occurred. The Division has the power to investigate claims, and the power to conciliate claims, meaning the division will try and help you settle the claim before a hearing before the New Jersey Office of Administrative Law. If you are unable to settle the claim, after a hearing the Director of the Division of Civil Rights will issue a final order. Once that final order is issued, it may be challenged by filing an appeal with the Appellate Division of the Superior Court of New Jersey. The nuances of discrimination based on national origin can be challenging to decipher. However, our experience discrimination attorneys at the Derek Smith Law Group, PLLC, have years of experience navigating the complex world of administrative hearings, helping our clients find the relief they deserve for the unscrupulous actions of their employers. WHAT IS NATION OF ORIGIN DISCRIMINATION IN PENNSYLVANIA? refusing to contract with any independent contractor who is licensed by the Bureau of Professional and Occupational Affairs, based on that individuals nation origin. It is further unlawful for any person, employer, labor union or employment agency to retaliate against an individual for filing a complaint or otherwise participating in any Commission proceeding. Our experienced discrimination attorneys at the Derek Smith Law Group, PLLC, are more than happy to assist you in bringing your claim in Pennsylvania, having years of experience working with the PHRA. NEW YORK & NEW JERSEY EMPLOYMENT DISCRIMINATION LAWYERS ARE READY TO TAKE YOUR CASE. If you are unsure if your situation qualifies as national origin, race, or religious discrimination, let an employment discrimination attorney at the Derek Smith Law Group, PLLC review your discrimination case. We offer no-cost, no-obligation consultations to prospective clients in New York, New Jersey and Pennsylvania. Our employment law firm operates on a contingency fee basis – if we fail to recover money on your behalf, we do not get paid. Contact us at 212-587-0760 or toll-free at 877.469.5297, or fill out a contact form at the top right of this page and click submit.